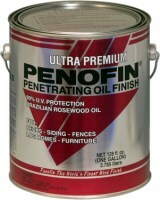 Ultra Premium Red Label Wood Finish is formulated for all wood species. 99% ultraviolet protection via trans oxide pigments. Great for decks, siding, fences, gazebos, outdoor furniture, boats, docks, or any wood structure in a harsh weather environment. Smooth surfaces: 200-300 square feet. Rough surfaces: 125-175 square feet a gallon of Red Label Wood Finish. Expect 3-5 years on vertical surfaces, 1-2 years on horizontal surfaces depending on use and weather exposure.